Marvel’s Black Panther is a box office phenomenon that seems destined to reshape African-American identity in the 21st century. The movie introduces viewers to the fictional world of Wakanda, a mythical African nation with that has developed technological mastery without sacrificing their cultural heritage. Audiences are thrilled with the ideas of the movie, which are heavily influenced by what critic Mark Dery called Afrofuturism in his 1993 essay “Back to the Future.” Dery explained that the ideas encompassed an alternate vision of the future, combining elements of science fiction with psychedelic hip-hop, rap and other things which are considered black technoculture. The idea is expressed in literature, film, visual art, and music. The Black Panther soundtrack by Kendrick Lamar is moving up the charts. However, if you are looking for a deeper dive into the music of Afrofuturism, here are some deeper cuts to get you started. The jazz scene of the 1950’s and 1960’s was bursting with musicians who epitomized Afrocentrism, but perhaps none was as mercurial as Sun Ra. Born Herman Poole Blount, Sun Ra created his own cosmic philosophy., leading a band with an ever-changing lineup called The Arkestra. Sun Ra made up his own mythology, claiming to be an alien from Saturn who was sent to earth to teach about peace and love. His music was wild, avante-garde jazz that pulled on every era of jazz to create something new. Sun Ra described his beliefs as equations rather than philosophies, and he drew on many different esoteric sources to create something that was totally unique. Scratch Perry is one of the most innovative music producers of the 20th century. A pioneer in the development of dub music, Perry released dozens of albums with his house band, the Upsetters, which are drenched in techno-amped versions of old-school reggae. Perry influenced generations of musicians, producing for artists like Bar Marley, Max Romeo, the Beastie Boys, Junior Murvin, the Congos and many more. Perry’s contemporary, King Tubby, revolutionized the role of the sound engineer, leading to big breakthroughs in dub during the 1960’s and 1970’s. King Tubby is credited with inventing the idea of the remix, which is central to the mashup of styles found in Afrofuturism. King Tubby made it possible for sound engineers to be recognized as true artists. Everyone knows Prince, but as arguably the biggest and most important Afrofuturist artist of the 1980’s, he deserves an audience attuned to his music with different ears. The Purple One was a multi-instrumentalist with a habit of creating his own reality. Prince changed his name to a symbol, bucked the studio system, and showed artists that there was a new way to produce and disseminate music, and it was through the internet. Prince embodied the idea of black technoculture. And his music was the bomb. One of the most heralded figures of Afrofuturism is Otavia Butler, who is most well-known for her book Kindred, a work of speculative fiction which follows the journey of Edana, a woman living in California in the 1970’s who is transported to the antebellum South. Erykah Badu picked up this thread and incorporated it into the music video for her 2000 single, “Didn’tcha Know.” Badu channels the idea of the black woman as the giver of life and then migrates across a white desert, making her own odyssey of time travel. Her video Window Seat explores injustice by placing her on the scene at the assassination of JFK.Badu’s music explores historical events, fantasy, and religion in order to create something new. Alt hip-hop group Shabazz Palaces is a Seattle-based duo which kept their identities a secret in order to serve their greater mythology. Ishmael Butler is one half of the duo; as a member of Digable Planets, he fused rap and jazz in a way that continues to reverberate. Tendai Maraire forms the other half of the group, is the son of Abraham Dumisani Maraire, who is is often credited with introducing the music of Zimbabwe to the United States. The group creates musical landscapes that are out of this world. As part of a collective called Black Constellation, Shabazz Palaces host “Black Weirdo” parties with visual artists, fashion designers and other artists. Their 2014 album resounded with the themes of black kings and queens, the perfect complement to Wakanda. 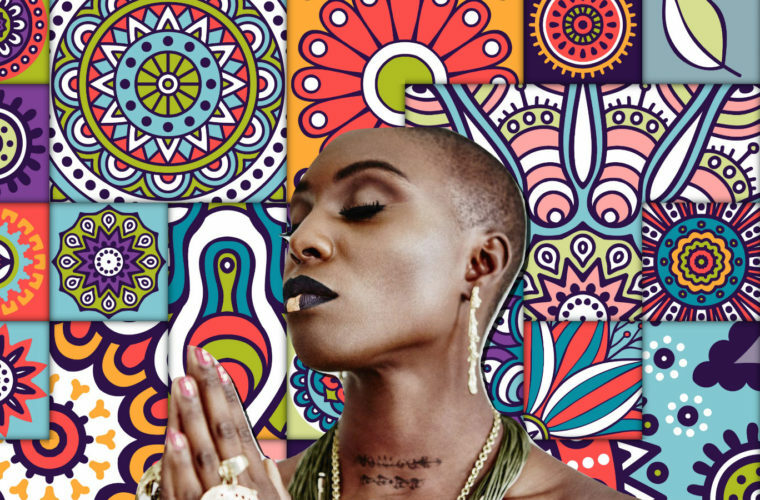 Championed by Prince, Laura Mvula is a British songwriter who combines funk, pop, R&B and soul music and conveys it in a beautifully spiritual manner. Mvula explores themes of past and future, spirituality and distance with a minimalistic bent that takes the audience on a ride to another country. Mvula uses visual arts to complete her vision, incorporating futuristic fashion design, black dancers and stunning imagery.